I have been subscribing to Seamwork Magazine since it began, and I have soooooo many of their patterns, yet I haven’t sewn many of them up at all (I think just 1!). I seriously had to justify continuing my subscription by digging into them and sewing some up. I also decided in order to chronicle more of my makes and details about them (mainly because I forget and like to check back here before I make my next one), I need to take pics of them pretty much immediately after I finish them, otherwise it just doesn’t happen. If you aren’t familiar with Seamwork Magazine, it’s a digital magazine that includes lots of sewing article yumminess and two patterns each month. 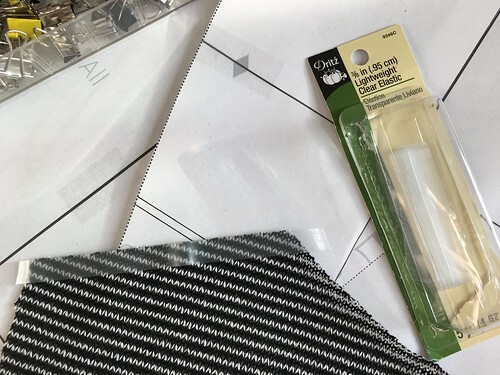 If you don’t like the two patterns that come with the issue, you can sit on your pattern credits and use them for Colette Patterns. Seamwork’s patterns are focused on sewing quick garments in a matter of hours, and often skip the smaller details of longer and more detailed patterns. To begin my Seamwork pattern sewing journey I selected the Oslo Cardigan, an oversized cardi that can be made in a variety of knits. My measurements put me in a size XS, and I decided not to shorten this cardi at all. I’m 5’3″, and I wanted it to cover my bottom in case I wear it with leggings. I think when I use a heavier weight knit I may shorten it 2″. 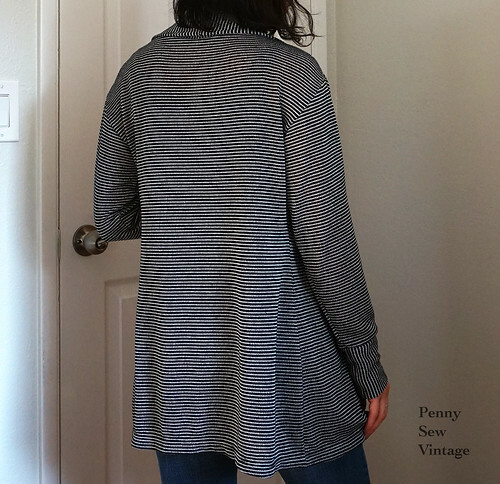 I used a poly/rayon sweater knit fabric that is lighter weight and has a looser weave. 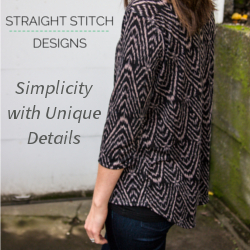 It’s Black and White Mini Stripe Lightweight Stretch Sweater Knit from Cali Fabrics. I love their storefront in San Francisco, but I can’t always make it over there because kids, so shopping from their smaller online shop is always just as good, plus I love supporting small businesses, especially local ones! Anyway, this sweater knit is perfect for this oversized cardi, and it works for our warmer winter days, but I think it’ll be perfect come spring. I wouldn’t call it a beginner’s knit because of the loose weave, but a little wonder tape helps at the beginning and ends of the seams to keep them lined up when serging. I did make a few changes during construction though. I shortened the cuffs a little because I didn’t want to fold them up, and I knew they’d be too long as is. I also switched the stripes’ direction to add a bit of interest. I added clear elastic at the shoulder seams too to keep them from stretching out, especially with this fabric. It helps stabilize the seam too which is important with this dropped shoulder and fabric combo. I serged the entire cardi and used my coverstitch to hem the bottom. I didn’t press the bottom hem after sewing it, so it’s a bit wonky in the above pics, but it has since been pressed. Just goes to show how important it is to press when sewing knits! Lots of steam! I love sewing knits, so quick and comfy. I’m pretty happy with my casual Oslo and know I’ll be trying it out in some other knits. I’m looking for a heavier cardi for winter, so I’ll be sharing another one soon when I find the right fabric. If you’re interested in trying out Seamwork yourself, you can get your first month for $3 using this referral link. Alright, I’m off to sew another Seamwork pattern with a fabric I’ve had in my stash for a couple of years…let’s hope I love that one as much as this one!